This coming July will be 2 years since we moved into our little cottage. Two years already! We’ve done a lot of updates over the last 18 months but our cottage kitchen has seen the most change. I thought it would be fun to go back and see how far it’s come (and how far we have to go). I loved this kitchen from the moment we stepped into this house. We left our beautiful, newly renovated kitchen in Illinois so I really wanted our new house to have a kitchen that, at the very least, had good bones. This one didn’t disappoint. Sure it needs work but most of the issues in this space can be fixed with a little bit (or a lot) of work. This is where we started, before we moved in. This space looks good in photos but it definitely has issues. The floor tile needs replacing, the melamine cabinets are in rough shape (every door is chipping or peeling), the sink has big chips in it and the faucet wasn’t even attached. Besides all of that, the microwave was broken, the electric stove was beyond disgusting and the dishwasher was rusty inside (and it didn’t work). Some changes could wait, like new flooring and cabinets, but the faucet, stove and dishwasher needed to be replaced right away. Before we could hook up our new appliances though, we had to run a new gas line. The new stove, the furnace we had to buy and our old dryer needed gas so we ran and hooked up a new gas line. It was a big job, and the first time we ever tackled something like this, but we did it (and saved a lot of money). With the faucet, new stove and dishwasher all hooked up and working, I moved on to the next task, painting the kitchen island. Such an easy change but it made a huge difference in the way the room felt. You can see all the details on how I transformed it here. The next change on the list was the wine rack cabinet on the dining room window wall. From the moment we stepped into this space I knew it would have to go. 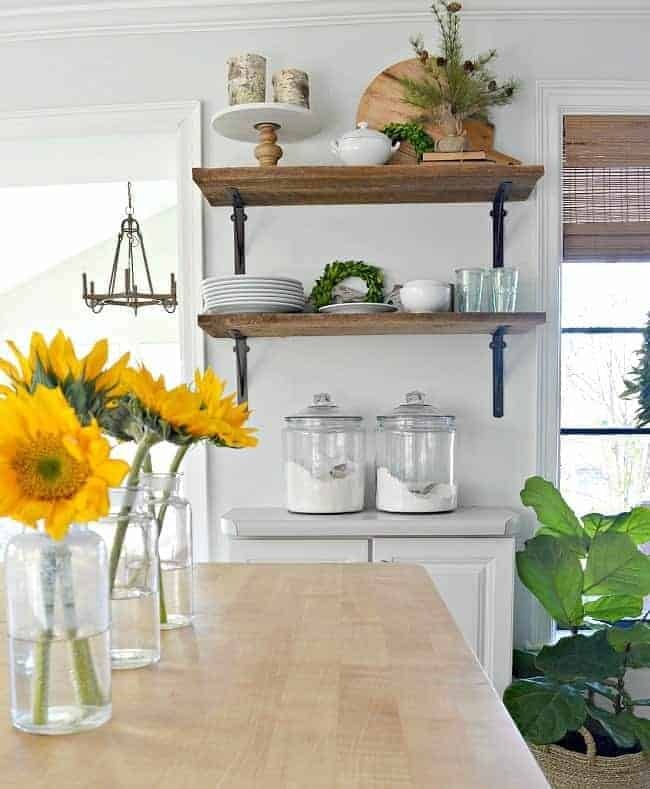 I needed a place to keep my dining plates, and everyday dishes, and barn wood shelves were the perfect solution. Check out this easy DIY, here. With the big things on the to-do list done, I moved on to a few cosmetic changes. The first one was fixing all the holes in the walls so I could paint. I went with Benjamin Moore Paper White, Regal Select, Eggshell. Love the new color! I also went for a big change with our casement windows and painted them black, here. This project wasn’t a quick or easy one but the results are worth it. Best. change. ever! Yeah, we just couldn’t stand to look at the florescent light anymore. This project was way more involved than we thought it would be (plaster ceiling, ugh), but we’re so glad that it’s done. 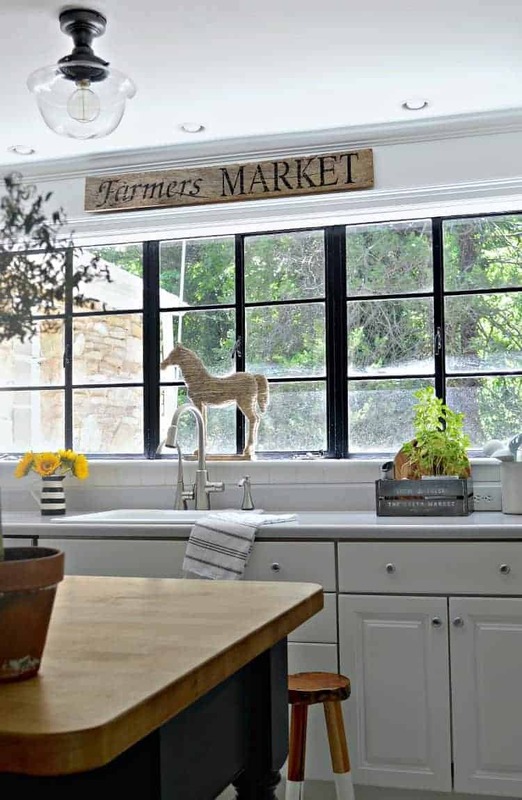 Once the window was done and the light was hung, I added my DIY farmer’s market sign over the window. Love the addition of the warm wood on this wall. I think we’re done in here. Well, at least until the renovation. We haven’t really discussed particulars but I have a ton of ideas already. Of course the floor will be replaced, as well as the cabinets, countertop, backsplash and sink. The microwave will go (we never use it anyway) and a new stove hood will be built in its place. Other than some new lighting, and maybe a new refrigerator, that will be it for this space. You can see how the cottage looked when we first moved in (there’s even a video!). Kristi I love this kitchen the window to die for. We are moving across the street and I am wondering if I see a hint of gray paint behind the white cabinet doors? By the windowOr is the hardware? If not I may try the look . It looks as thiugh there is. Any suggesstions on a shade? Thanks so much Tina! The window is my favorite thing about our kitchen. 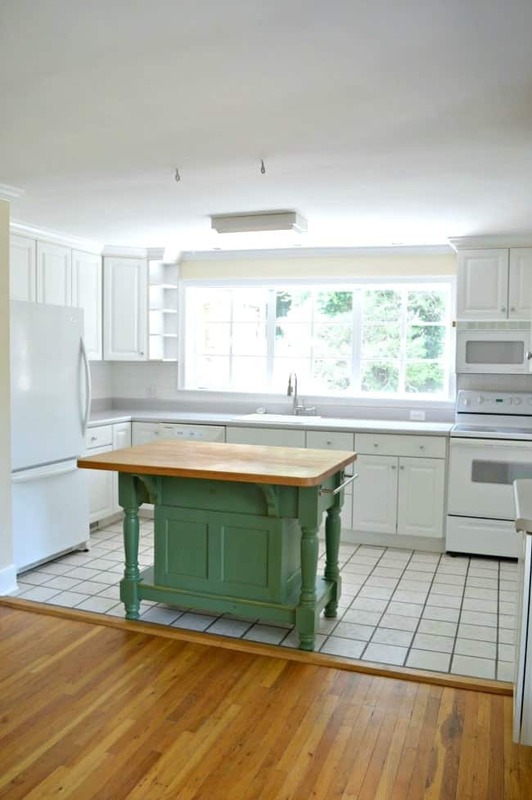 As for the cabinets, they are white melamine so no hint of gray. 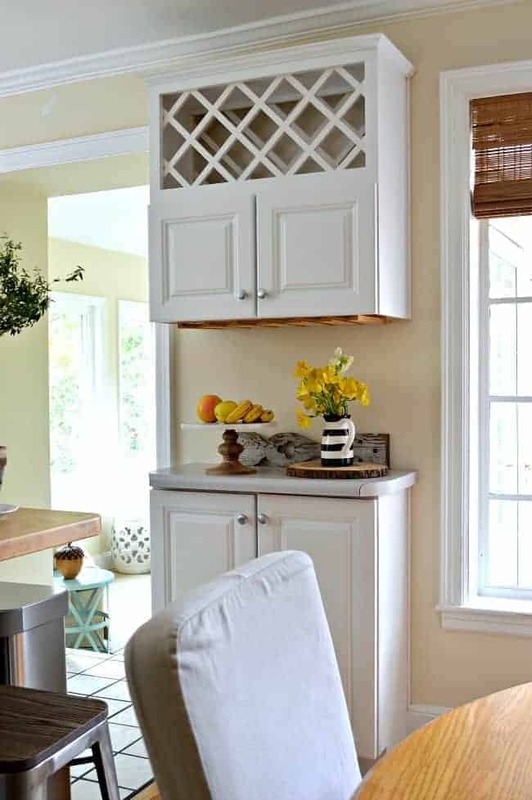 The wall above the sink is painted in Benjamin Moore Paper White, which is a gray, but the cabinets are all white. I don’t mind giving you suggestions. Are you looking for a color for your cabinets? WOW! 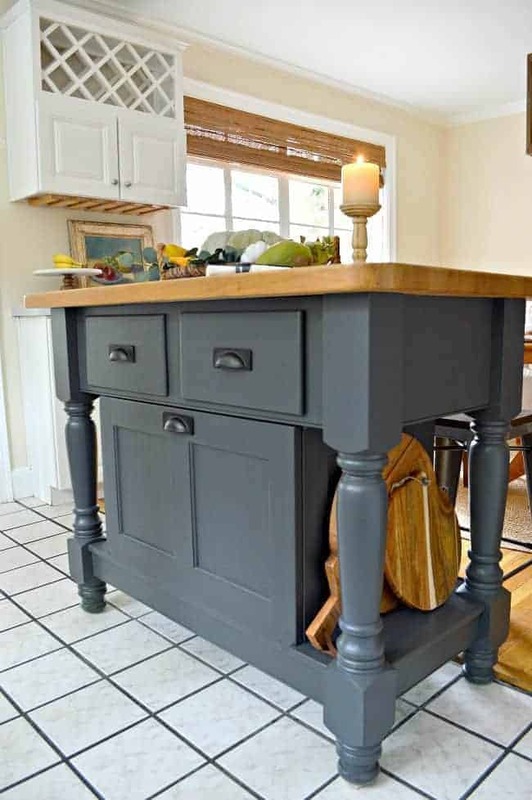 – We love the changes you made and we would like to paint our bare wood island the same color. What color / paint type / brand was used. I just can’t seem to figure it out. One blogger said blue, you said grey and the notes stated white which I assume was the wall reference and just a misprint. 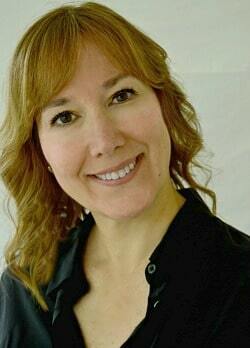 Thanks for doing what you do… or doing what you did! Hi Kristi! Fantastic post – I was wondering if there was a way for you to supply me with a printer-friendly version? My kitchen has a very similar layout, so I’d love to be able to print it out. Thanks! Hi Gregg! I sent you an email about your question. I love what your paint did for the room! 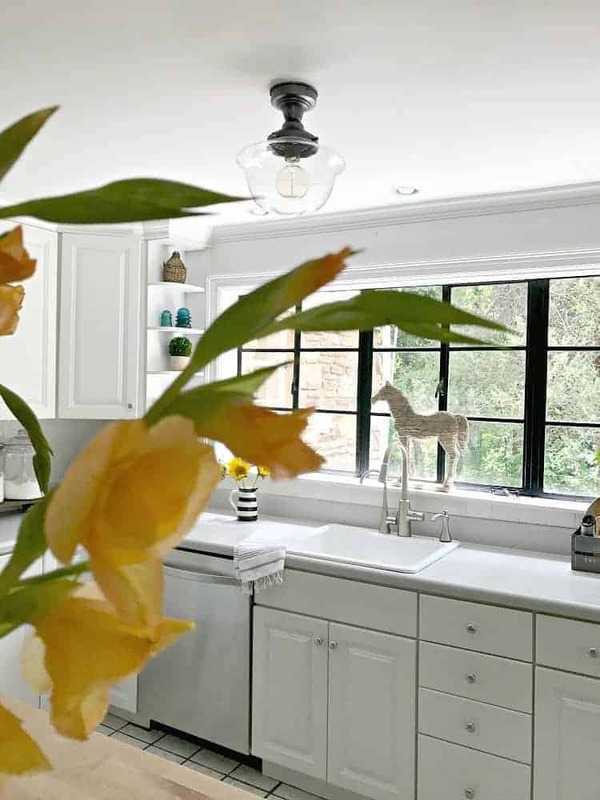 Gorgeous island now and that was bold of you to paint black on the window area but it was a terrific idea because it looks great!! Beautiful decorating!! That looks very nice. Love that you painted the window area black also. Looks nice with the island. 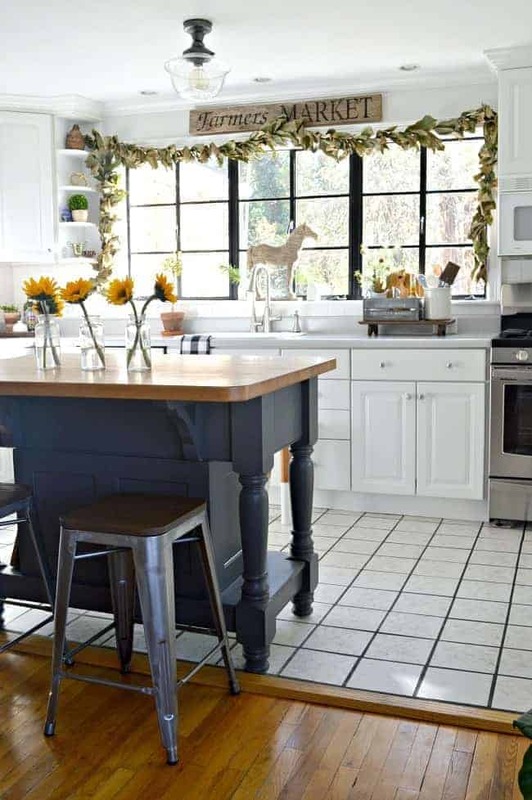 I love the changes you made in your cottage kitchen. It is a great start and I look forward to more updates. Thanks so much! We enjoy this space but I’m looking forward to making more improvements. 🙂 Thank you for stopping by. 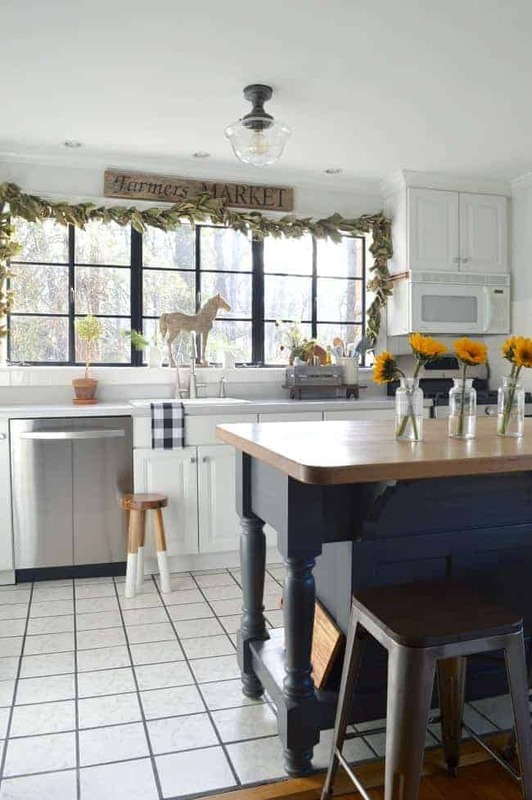 You’ve done spectacular work (through out the house) and the kitchen is just so cute! You did mention not replacing the microwave when you do more restoration work. 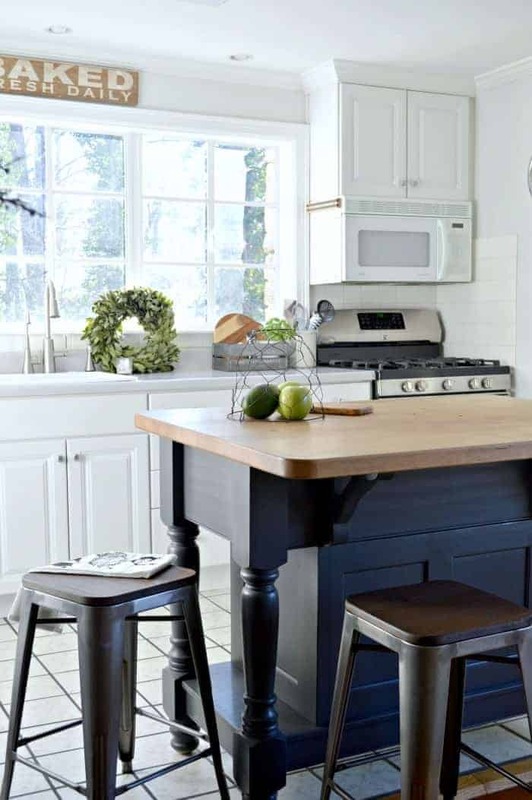 I’m wondering though you don’t use it now, how that might affect someone who may want to purchase the home in a couple of years – an above the stove microwave is terrific use of space. If you’ve no plans on selling the house in the next 10 years I guess it works for you, but I wonder if you might regret not having one and who’s to say you’ll not want to try and use it for reheating certain things. Thanks Margaret, I appreciate it! It is surprising what just a few things like painting and changing lights can make an area look so different. As you know, I just LOVE your kitchen. Love that schoolhouse type light is the perfect touch. Your kitchen looks fantastic now, can’t even imagine better. I look forward to following along. I just LOVE home improvements and decorating! Thanks so much Deb! It’s really turned into a space we both love. I’m looking forward to making it even better. I just can’t get enough of this beautiful little home. Since I live alone, and have for many years, I’m really into cozy and warm and inviting and your home is exactly that. I’m sure you see the things that still need to be done, but your followers see the charm and warmth of it already. Keep all of us admirers in the loop as you truly make it your own. Would you believe you email post went to my spam mail? I always make it a point of checking this folder and my “trash” folder because I have found mail that should not have gone there. Well, on to your post. I have to say I just love your little cottage, and I can see the potential you must have seen when you bought the place. You sure have done a lot of work and it looks great! I can’t believe it has been two years either. I’m slowly working on my place. Unlike you, I don’t have someone to help with the things I can’t do. I have to con my sons into doing some things. Mind you, they are very helpful, but they have their own businesses and families and sometimes their schedules don’t coincide with my schedule. ???? No problem, we work it out. I’m happy to have them around and of course, if it was an emergency they are right there to help. 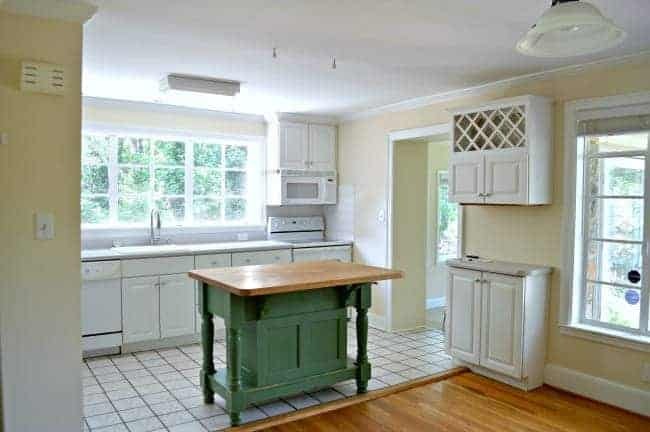 Side note: I have been thinking of buying an island for my kitchen because I am so over the table and chairs I have now. I didn’t want to spend too much money being on a “fixed income” now. My younger son was telling me about getting rid of this huge TV cabinet that the TV doesn’t work and my current TV is sitting on. I realize it is a space stealer but, it is solid wood and it will just get trashed because no one has a TV cabinet nowadays. Lightbulb goes on in my head! 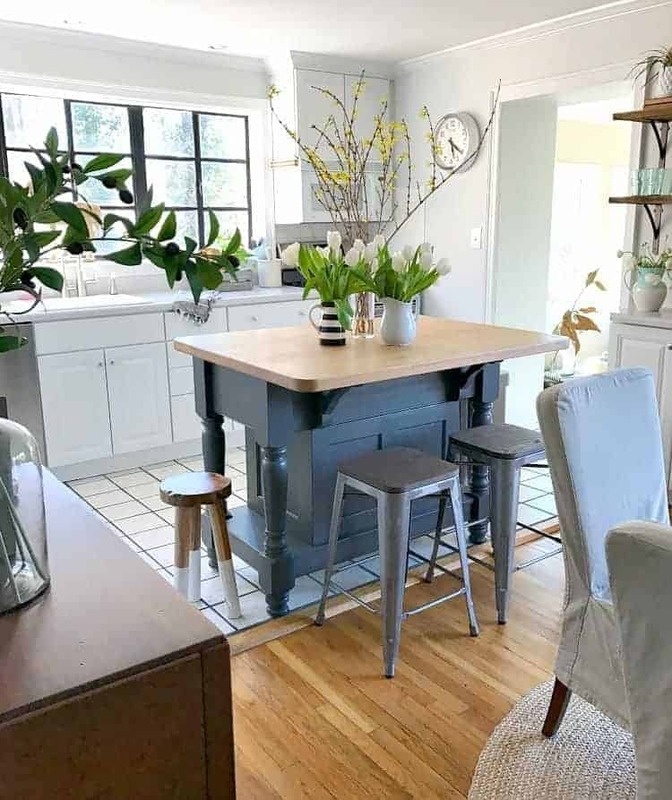 How about if I take the old TV out of it and put legs on it to raise it and paint it white, get a new wood top for it extending to put stools for seating and voila I have my island with minimal cost! It has doors on it to hide the TV which is great so all I have to do is put some shelves in it and put a back on it. I’m thinking beadboard for the back. Sorry for the long message, but I just had to tell you, I’m so excited to get started! Hmmm, you are the second one to tell me about my emails. Thanks for the head’s up. I’m trying to figure out why it’s happening and correct the issue. I like your idea to turn the tv cabinet into an island. It sounds like it could work. Can’t wait to see it. I love a good before and after with all the details in between the two! You put your heart and souls into this kitchen and it shows!!! I am still over the moon with your black painted windows!!! Thanks so much Kaycee! Yes, the window is my favorite too. 🙂 I love that it’s the one thing you first notice when you walk into the space. So different from our last kitchen. I Forgot how cold and blah that kitchen was when you bought this house. Now it looks like a welcoming family home. It is amazing how fresh paint and colors can totally change the feel of a room. You still have a ways to go but at least it looks like your home now. Thanks Debbie! It is amazing how fresh paint can change a space. That’s really all we’ve done (except for the appliances). I’m looking forward to finishing it off. Looks beautiful. I have a 99 yr old house…plaster walls at my house too! Were you able to do pkaster repair yourself, if so…what product did you use? Thanks so much Katherine! Wow, 99 years old. That sounds fabulous! To answer your question, we repaired the holes in the ceiling with spackle. It worked well and you can’t really tell where the repair was done.Hope that helps.